In my first post, I made it clear that I’m not a mermaid. In this post, I’m introducing a series about a certain thing my husband does. He’s cute and I love him. A tell is the body language or key phrase someone uses that indicates to others that he is up to something. In poker, a tell will call a player’s bluff or give away her hand. In football, a quarterback’s body language might “tell” the play he’s going to run and result in a sack. I don’t play either, but I like to watch to see if I can spot the tells. Together, the terms create the “Honey Do” tell. I’m pretty sure everybody has one. Translation: Diana, where are you? Uh, oh. Repetition with increased volume is translated this way: Diana, please assist me. Are you wondering how I got all that from his calling only my name? Easy answer. We’ve been married for 20 years. I’ve heard it a few times. It’s also the only time he calls me that. Translation: I’m about to mow the lawn. Digging deeper, I know that he really means: You are about to help me mow the lawn, so change into mowing clothes. 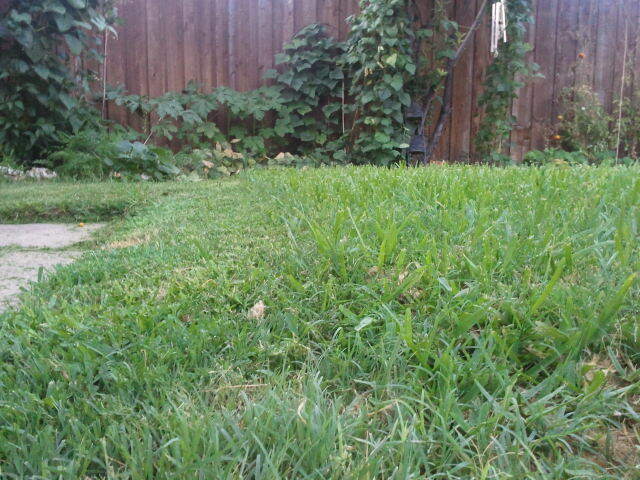 The yard begging for me not to mow it. Next week, the teenager who usually mows our lawn will be back from vacation. I’ll be SO happy, and the yard won’t have so many mohawks. I thought about my husband’s “Honey Do” tell as my hands got tingly from the vibration and the mower chewed up little, inedible onions from the garden. The yard smells yummy. It made me wonder if raw onions might serve as an organic mosquito repellent. 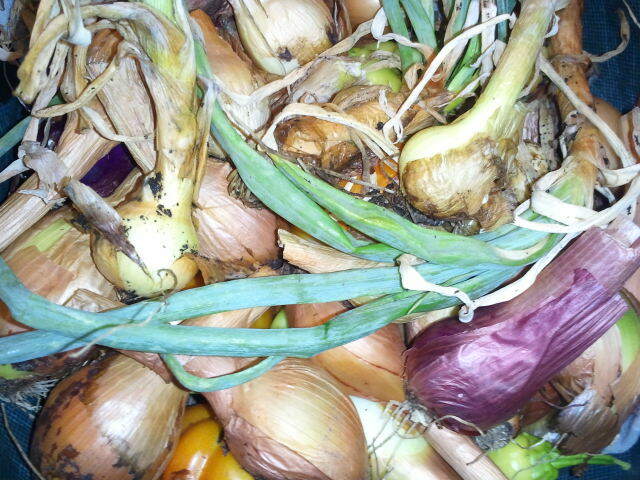 White, yellow, and red onions from our garden. These are edible. My husband finished the edging and blowing before I finished the mowing, which gave him time to cool me off with a “spritz” from the hose. Really? OK, well, it was 100 degrees, so I didn’t mind–until the spritz became a squirt of cold water. In all honesty, I didn’t mind that either. It was too flipping hot. It’s worth repeating that he’s cute. Very nice. I learned something new in the middle of a honey-do moment and created a possible mosquito deterrent with onion mulch. Oh, no. Here we go again. I’ll tell you about this one later. I have to admit that my first reaction is almost always, “Oh, no, what is he up to now?” However, I can always look back at the honey-do moment and find something to appreciate. For Honey Do Tale #1, I learned that onion mulch might repel mosquitos. Do you have a “Honey Do” tell? Perhaps your spouse, partner, child, parent, or friend has one. I’d love to hear your honey-do tales.